Q1: Where do I find out about the Science programmes in Trinity? Q2: Who can I contact regarding Admission to Science courses? Q3: Who do I contact regarding Mature Entry to Science courses? A: Please contact the Academic Registry regarding Mature entry criteria at the following Mature Student Office Website. Q4:Who do I contact regarding the Trinity Access Programme? A: Please contact the Admissions Office regarding the Trinity Access Programme criteria admissions@tcd.ie. Please also see the Trinity Access Programme website. Q5: What type of Science Degree can I get from Trinity? TR060 Biological and Biomedical Sciences: Biochemistry, Botany, Environmental Sciences, Genetics, Human Genetics, Immunology, Microbiology, Molecular Medicine, Neuroscience, Physiology, Zoology. TR061 Chemical Sciences: Chemistry, Chemistry with Molecular Modelling, Medicinal Chemistry, Nanoscience. TR063 Physical Sciences: Physics, Physics and Astrophysics, Nanoscience. TR035 Theoretical Physics Mathematics (TR031) and Theoretical Physics (TR035) also fall within the Science area but these degree courses are not covered by the questions and answers below. NOTE: Former direct entry courses – Chemistry with Molecular Modelling, Earth Sciences, Human Genetics, Medicinal Chemistry, and Nanoscience are now available through the appropriate science programme (see above). Earth Sciences has been combined with Geology to form Geosciences. Q6. How do I get a place? How many points do I need? A: In recent years, students taking Science and related courses have come to Trinity with between 500 and 600 points. Minimum entry points. The new, reimagined Trinity Science programmes will be offered for the first time in September 2018, therefore, we cannot predict the exact number of points for each stream but we expect that they will be similar to the points in recent years. Q7. Can I apply for more than one of the Science courses? Yes, students may apply for two or more science courses in order of preference on the CAO form. The specific science subject requirements are the same for each science stream. Q8: If I expect 580 points, would I be wasting them by applying for Science? A: No, not if you are driven by a natural curiosity about the physical and biological world about you. Above all, make sure that the third-level course you select is a course that really does interest you. It is foolish to apply for 'high-points' courses like medicine or law if you are not intent on spending your life working in these areas. If you have very high points and choose a Science degree course out of interest, your chances of success, both intellectual and financial, in your chosen field are outstanding. Q9: What kind of study programme does Science in Trinity involve? Do I specialise in one science subject from the beginning? TR060 Biological and Biomedical Sciences: Core modules: Biology; Chemistry; Mathematics. Optional modules: Geosciences; Foundation Physics; Science Education and Communication. The new science programmes include customised core curriculum in each stream. The capstone/research final year project is a wonderful opportunity for students studying science in Trinity to work with scientists who are world renowned specialists in their field. Q10: Does it matter which modules I take in the first year? A: Yes. Students choose modules from a wide range of subjects to a total of 60 credits (30 from each semester). Students must take modules in subjects which are related to the specialisations they are interested in taking in 3rd & 4th year. Advice on which modules to choose will be given during orientation and throughout each of the four years of the degree. 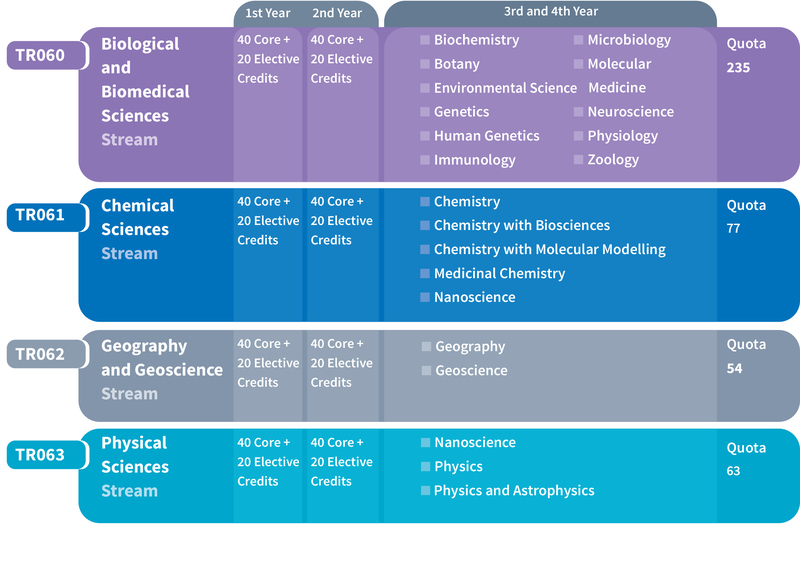 The new programme structure allows students to consider any of the moderatorship subjects on offer in their stream, with two exceptions, students who wish to specialise in nanoscience must take the full 20 credits in Physics, 20 credits in Mathematics and 20 credits in Chemistry in the Fresh years. Q11: Can I take up a subject I haven't done in school? A: Yes - in fact you may have to. The Geography and Geology courses start from scratch, and Biology does not require previous knowledge (though it helps). Physics and Chemistry are generally found to be more difficult without previous knowledge, although physics provide dedicated small group tutorials and chemistry provide additional support for students who have not taken Chemistry in the leaving certificate. However, there is a customised chemistry module for the biological and biomedical stream in first year. Q12: How many hours per week will I need to study? A: You will attend about 12 hours of lectures and 12 hours of laboratory work per week for 24 weeks. As a rough guide, the same time again will be needed to read, to write up practical classes, and to study alone. Q13: Are there quotas at the start of 3rd year for any of the degree options? A: Yes. Demand may exceed the number of places in some courses. However, in recent years, all students who have performed reasonably well in second year (a II.1 grade or above) have gotten their first preference of degree options. Q14: What if things don't work out? If I have a problem, who can I talk to? A: Every student in Trinity is allocated a tutor where you can go to discuss any issues of concern. Tutors are members of the academic teaching staff who take on the additional role of helping students through any difficulties. Alternatively, you can call into the Science Course Office where we will be available to answer any questions regarding the course. Q15: If I start in one stream and find I like one of the other subjects more, can I transfer in second year? Q16: If I start a Science course and find I don't like it, can I change to another degree course? Q17: What kind of job prospects come with a degree in Science? A: A Science degree is a passport to many jobs. The core skills of critical thinking and problem solving that come with a scientific education, as well as data handling and analysis, communication skills and specific technical knowledge in a chosen field mean science graduates are in very high demand. Your degree may lead to analytical or research work in industry or the state sector. It also opens up a wide range of other employment opportunities such as teaching, medicine, information technology, financial services, consultancies, journalism, and marketing. Many graduates choose to take a higher degree. And many will end up in jobs which have not been created yet! Q18: Should I join any student societies?